Primorsko Beach resort, on the Black Sea in Bulgaria. Location: Primorsko is a climate resort and a favourite place for youth tourists. It is situated 52 kilometers south of Bourgas, on a cape jutting between the Stomoplo Bay and Diavolski ( the Devil’s) Bay. The average sea level is 16 metres. 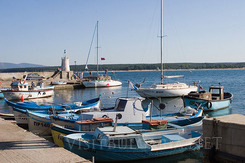 Primorsko has a sea port, which offers regular bus lines to Bourgas and to the towns and villages on the southern Black sea coast. 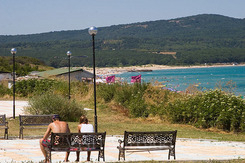 The Beach Stripes: Primorsko has a huge beach stripe with over 80 holiday homes and summer camps. Dine & Nightlife: The centre of the small town of Primorsko is urbanised but the nearby areas on the water are still pleasant. There are many small cafes, discos that open all night long and cheap places to eat Accommodation is available among the high number of small family hotels and rooms in private houses. Nightlife in Primorsko can be a real fun if you enjoy wild international parties. The climate is influenced by the Mediterranean temperatures and the main tourist active season are from May till October. The world famous Maslen Nos (The Oily Cape) is situated some six kilometers southeast of the village of Primorsko. Maslen Nos Cape is noted for its fantastic and eye-catching natural fiord- like attraction. A unique sanctuary dating from ancient Thracian times can be visited at five kilometers north of the city- this is the biggest megalith sanctuary discovered so far in Eastern Thrace. In 1998 Primorsko was awarded the prestigeous Blue Flag by the Foundation for Environmental Education in Europe - a recognition of the purity of the nature in its region. The River Ropotamo is in the vicinity of Primorsko. Ropotamo is one of the largest natural reserves of Bulgaria. This reserve is world famous for its rare birds and plants, that can be found only here.